Strict Enforcement of San Francisco Code Is Catching Plumbers Unaware - Jay R. Smith MFG Co.
Change is in the air, and plumbing engineers need to be prepared. Recently inspectors in San Francisco have become more stringent in enforcing a code that has been on the books for a while now. 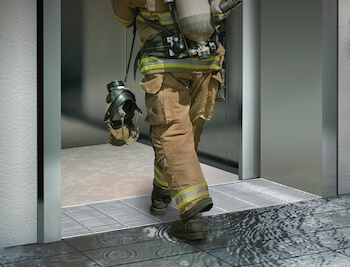 It is a code that many municipalities have, which requires a trench drain that can accommodate a 100 gpm flow rate be placed at all Fire Service Access Elevators (FSAE) lobby door openings. Contractors in San Francisco are now faced with having to show documentation that the drains they are specifying and using in construction do in fact meet the 100 gpm flow rate. Rick Mesnickow at Elmco and Associates said he’s not only seeing it in San Francisco but that it is migrating across the Bay to Oakland and he anticipates it will soon spread throughout California. As with many construction trends, it is expected to then spread across the country. Recently, Jay R. Smith Mfg. Co. was able to assist a plumbing contractor affected by the strict enforcement. The contractor found itself in a bind due to the fact there were no trench drains on the market in the sizes the architect required and that would meet the 100 gpm flow rate. Solving the problem was not just a case of simply making a custom drain that would fit the lobby entryways. This was a case where Smith engineers, due to structural constraints, had to come up with a solution that also allowed for outlets at the ends of the drain instead of the center— an additional requirement that would affect the flow rate. Otherwise, the contractor would have to go back to the architect and request changes to the design. Fortunately, Smith engineers managed to accomplish the task and did so in a very condensed timeline. Smith did not just engineer and build those drains; they sent them out for third party testing and verification so city inspectors and the fire marshal would have the documentation they required. Mesnickow and other representatives at Elmco and Associates are doing their best to get the word out to contractors across California, so they are not blindsided. Please contact us if you are in need of more information on 100 gpm Stainless Steel Threshold Drains or how similar codes may affect the job you are working on.